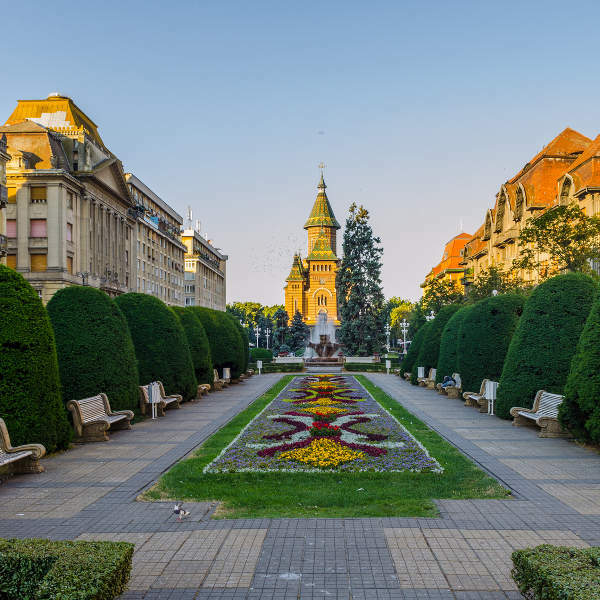 Located on the northern banks of the Bega River on the western fringe of Romania, the cosmopolitan city of Timisoara holds an alluring charm, propelled by its historic squares and buildings. The architecture is heavily influenced by Turkish, German and Serbian traits. The palaces, museums, churches and bars lining the cobbled streets are favoured tourist attractions. 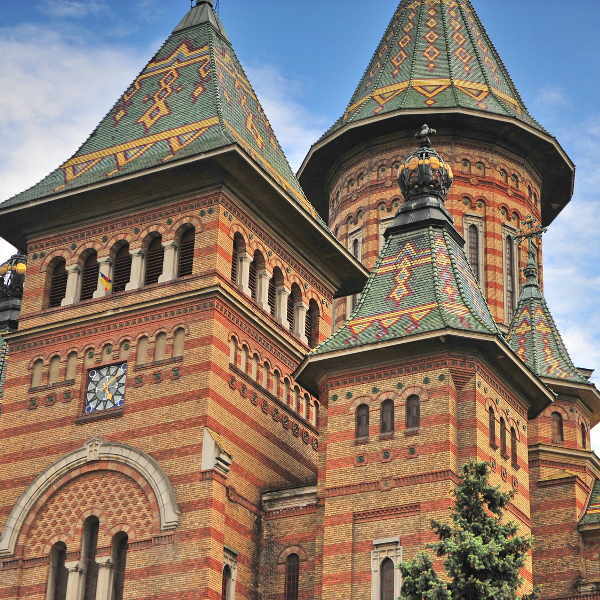 Cheap flights to Timisoara are now available for a limited time only, so book your flight today and prepare to be charmed by this city’s medieval attractions contrasted with its modern twist! Timisoara is home to Timișoara Traian Vuia International Airport (TSR), a 25-minute drive from the city centre. Stately buildings like the Opera House, Orthodox Cathedral and the old Bastion walls stand testament to the Baroque, Ottoman and Neoclassical influences visible throughout the historical quarters of the city. Explore the palaces, churches and galleries of Union Square, while the grand buildings and museums of Victory Square are symbolic of Romania’s revolution. Peruse the bars along Bega River and tuck into some street food along the cobbled streets. Discover the vast history and hidden gems of the city with comprehensive city tours, accompanied by charismatic locals. Visit the monasteries in the picturesque, Banat Highlands and walk through the vineyards, sampling the fine wines in Recas. Romanian summers see an influx of tourists, between June and August, and top attractions are often crowded. The shoulder-seasons in April and September/ October are the best times to visit, as the weather is pleasantly warm and accommodation and flight fares are significantly cheaper than during the summer. Timisoara is a city brimming with culture and there are plenty of film, theatre and music festivals to be enjoyed throughout the year. A few highlights include the Jazz Festival and Hearts’ Festival in July, as well as the international wine festival ‘’Vinvest” in March. Timisoara is one of the most cosmopolitan and prettiest towns in Romania. Located along the banks of the Bega River, it’s the largest city in the western part of the country. With an eclectic mix of Baroque, Neoclassical and Art Nouveau buildings, Timisoara’s squares and boulevards are made up of varying architectural styles. 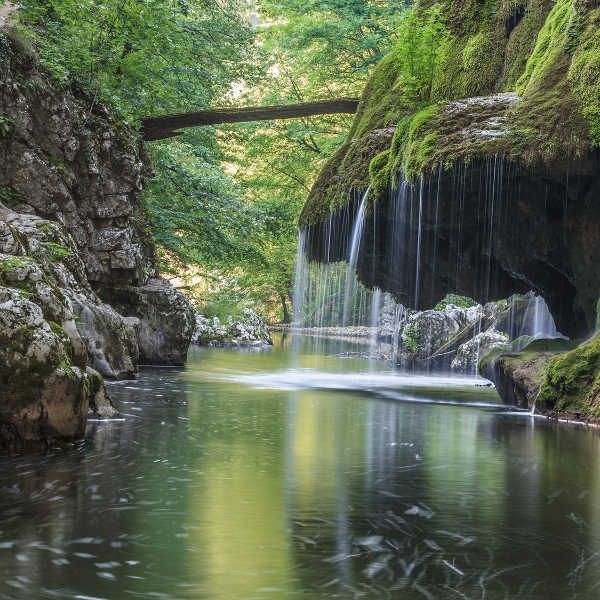 Its history tells of military and political violence when it was one of the major military bases against the Ottoman Empire, but now it’s a beautiful, peaceful place, regarded as Romania’s first free city – an ideal base from which to explore the surrounding Banat region. With influences from Turkey, Austria, Germany and Serbia, Timisoara has distinct architectural character and a vibrant cultural life. Often likened to Vienna with its year-round musical and theatrical performances, there is an abundance of art galleries and museums just waiting to be explored. The lively nightlife and sultry cafés keep visitors entertained into the wee hours of the morning. The city is a joy to explore on foot or hop on a tram to see the many churches and synagogues located in the elegant Jewish quarter. Visit the Metropolitan Orthodox Cathedral, where the Revolution of 1989 took place. The lush gardens of Roses Park provide a tranquil space from a busy day of exploring. Compare several airlines and book your cheap flights to Timisoara online at Travelstart! Travellers to Romania are not required to have any mandatory vaccinations, though it is advised to be immunized against Tickborne Encephalitis if you’re planning on camping in open areas and grasslands. Due to the large number of stray dogs throughout the cities it is also advised to take precaution against rabies. The dogs rarely pose a danger but, should you get bitten, seek medical attention within 72 hours at any major hospital. Please note that should you require medical treatment, hospitals require cash up front. Keep any paperwork safely stored for reimbursement claims from insurance companies. If you require any specific medication, bring it from home in a clearly-labelled container with a signed prescription note. Tap water is considered safe to drink, though most people prefer bottled water as it widely available and cheap. Timisoara is a fairly safe city, with petty crime no different to any other European city. Watch out for bag-snatchers and try not to keep wallets in your back pocket. Taxi drivers may try to take advantage of naïve tourists, so be sure to arrange a price before getting in or ask your hotel to organise a reputable taxi for you.